1. A root note - G.
2. A major 3rd - B. 3. An added 11th (otherwise known as a 4th but at a higher octave) - C. Since we have a 3rd in this chord, the 4th is not suspended. 4. 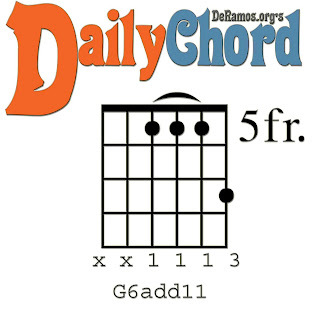 A 6th note - E.
This particular version of the chord does not contain a perfect fifth (D).